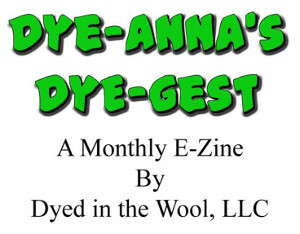 Leigh's Fiber Journal: Got Fleece? 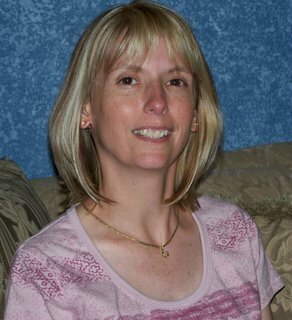 Gorgeous fleece, Leigh! Is it merino? Oh, that's just adorable. Did he disappear completely? Connie, that basket contains the makings of my Polpaca yarn. 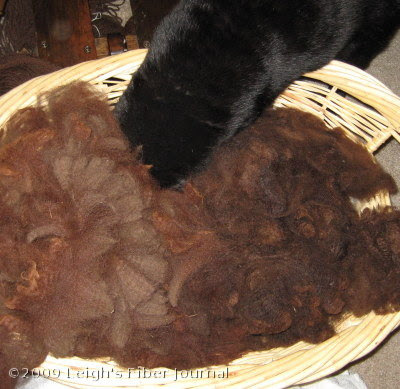 I have both Polwarth and alpaca in there, which I'm blending on woolcombs as I spin. Geodyne, he would disappear in it if he could! I think I pulled him out before he had the chance to get that far. Like Patrick mentioned about Bogey, I was really having a fit but the camera was handy and the whole thing was too cute to pass up. Beautiful fiber, both fleeces! Great combination. Cute Overload for fiber artists :-) thanks! I'd be snuggled into that basket too - yummy fleece! And for what it's worth - my verification word "catis"
I can't help but notice the sheep in the first picture. Did you also go on a buying spree when Bath and Body Works was selling them? Or did you procure sheepy goodness from somewhere else? I recognized those ears. My cat uses them when she's using her special cat invisible shield. It's the 'these aren't the droids you're looking for' ears. And the lack of eye contact. Because if the cat can't see you when they're doing the sideways ear thing, you can't see them either. All they have to do is move slowly and steadily toward their goal (wool, unattended left-over-cereal-with-milk bowl, room-not-for-cats) and life is good! hehe. LOL! 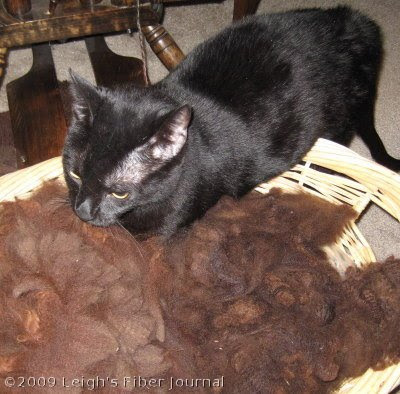 I love how all your fiber buddies are more concerened with the fiber than the cat. Have you made him anything out of all this nice fleece that he enjoys so much? Perhaps he could have some leftovers. Cathy, that's too funny; as in "catis in the basket of fleece". Pandora, my mom gave me that sheep a long, long time ago, as when my DD (now 25) was in a little girl. I'm not sure where she got it from. Holly, love that description. That's the situation to a T! Renee,you may be right. 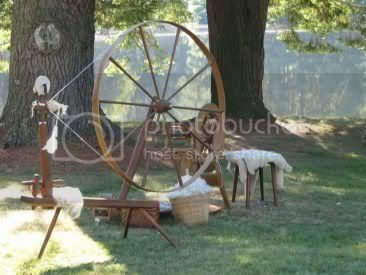 Of course, a spinner looks at those photos and knows he may be preparing to matt that fiber! I recently rescued a box of my best washed coloured Ryeland fleece - our little tabby cat Pheobe found it in the cupboard when she first moved in and she has slept in it for several months. I gave her an old woolen jacket instead, but she doesn't like it half as much. Now I feel mean and might have to buy a fleece just for Pheobe to sleep in. Oh my, here we go: Pheobe gets her way again. She has ruled this household from day one. That's cats for you. 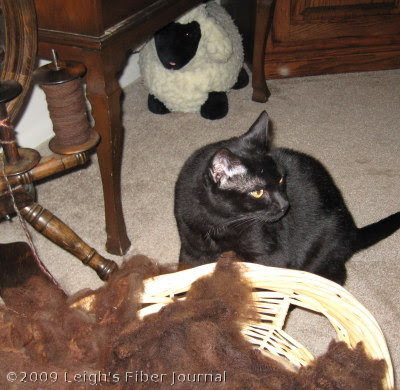 Yup - kitties love the wool! My Geoffrey likes it better than catnip. Oh, I'm sure he is just measuring that lovely crimp in those locks...an expert like that wouldn't dream of smooshing the fiber, would he? It looks like fun, Uncle Rascal!